Below are the current boats for Reel Action Fishing Charters. These boats are powered by Yamaha four stroke engine and Mercury four stroke engines. All three of our boats have enough power and range to take your charter miles into the ocean without issue. Riding on these boats is a pleasant experience due to how stable the boats are at speed. In addition to the strong deep-sea characteristics of the boats, they can also float on a mere 6 inches of water when we’re in the creeks or inshore flat waters. Captain Josh on his Carolina Skiff with top for those warm days! 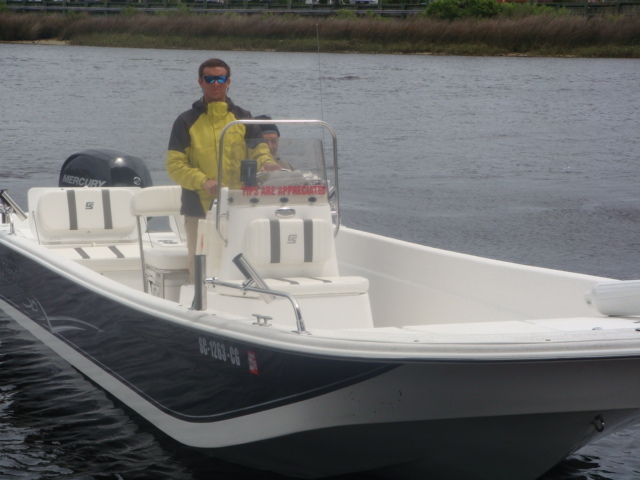 Below is one of our new family charter boats the 25.8 foot Carolina Skiff. 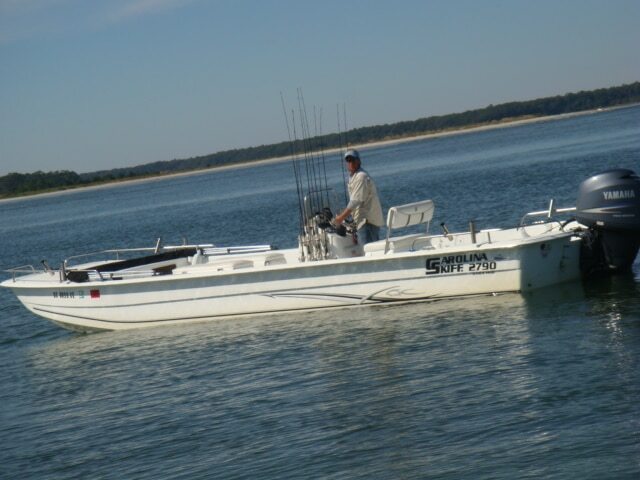 This boat is great for Myrtle Beach Fishing Charters because there is room for the whole family! It is also very stable in the water. To learn more about the fish we’d catch, we have compiled information here. Call to book your Myrtle Beach fishing trips before your dates are taken. Let us be your North Myrtle Beach fishing guide while your on your vacation in Myrtle Beach or North Myrtle Beach. Give us a call and we can book your trip today. Captain Johnny on the newest 25 foot Carolina Skiff. Our newest boat is in and it is fantastic! The Carolina Skiff is almost 9 feet wide and 27 feet long. The pictures below show Captain John in it. We can not wait for your family to experience this new boat . It is going to be even more stable then the 24 ft Carolina skiff we have. Book your Myrtle Beach fishing charters before your dates are gone. 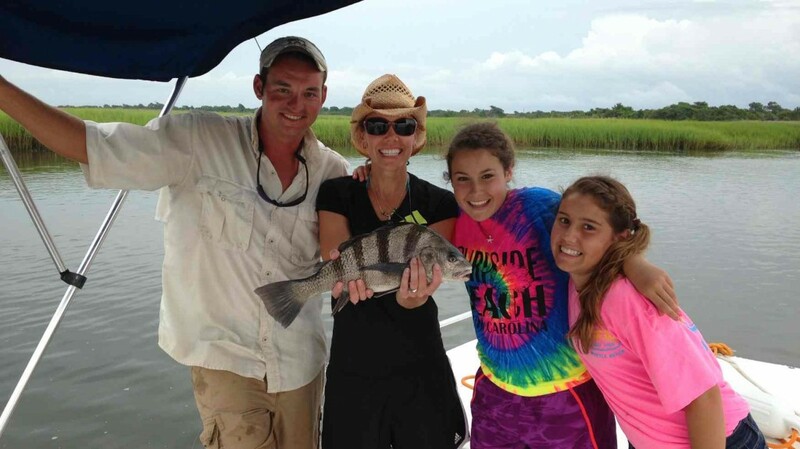 We now have three boats to take your family on your Myrtle Beach fishing charter.We can go deep sea fishing Myrtle Beach or inshore Myrtle Beach fishing, depending on your needs and desire for adventure. Captain John on his favorite Carolina Skiff. Reel Action Fishing Charters welcomes you aboard this year! Contact us to reserve your dates. Call Us To Book: (843) 997-3077 today! We respond to email quickly, but calling us on the phone is the best way to confirm your dates. You may wish to view our FAQs before inquiring. Prices above include first 1-3 persons, extras are $50 each. Feel free to call for any questions at (843) 997-3077. Let us know the dates you'll be in Myrtle Beach so we can check our calendar. Have you recently gone on a charter with us? I'd love to feature your photos! Our website uses a secure connection. We proudly serve customers from Little River, North Myrtle Beach, Myrtle Beach, Garden City Beach and Sunset Beach, NC. Proud to be rated on Google+. Contact us today to reserve your charter!